With over 60 years of experience, Sanitas has become the leading health and wellbeing company in Spain. Sanitas currently offers products and services adapted to the real needs of clients at each stage of their lives, through a unique, comprehensive healthcare model which includes health insurance, hospitals and health centres, dental clinics, residences for the elderly, and other health services. 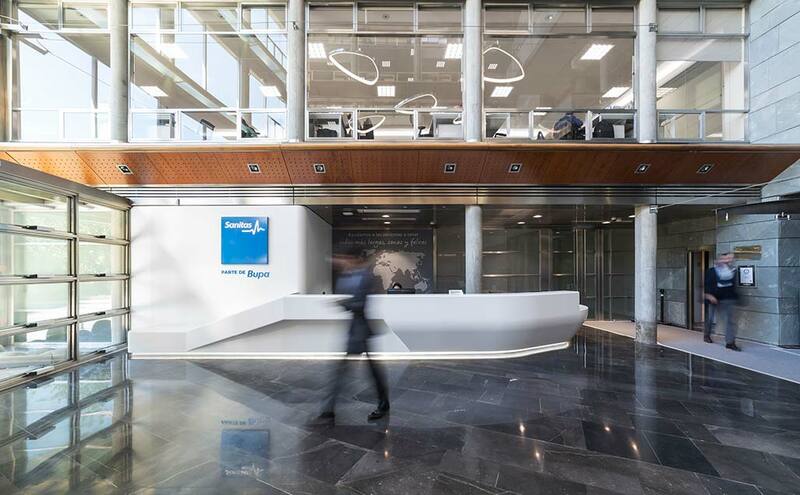 PORCELANOSA Group has formed part of the new central offices of Sanitas, with the new generation solid surface KRION. We can find KRION 1100 Snow White, transformed by the company Maderama, in the reception area of the spacious hall. This spectacular work consists of coverings, signage and units, in which imperceptible joins, machining and thermocurving have been applied. KRION was selected by the Sanitas / 3G Office team of architects as it is an ideal material for high transit spaces.